Hello. 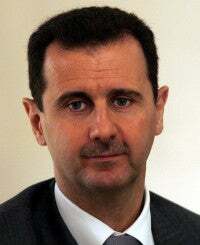 My name is Bashar al-Assad. I am the president of Syria, and in the last two years, you—the citizens of the world and their governments—have allowed me to kill 70,000 people. You read that correctly: I am an individual who has murdered 70,000 human beings since March 2011, and you have watched it happen and done nothing. I have killed many people: protesters, rebels, innocent civilians. You name a group of people and I’ve killed them. I have killed people with families and loved ones. I have killed mothers and daughters and fathers and sons, and I continue to do so. In fact, I’ve killed many people in broad daylight, but yet here I am, alive and still killing people. Because I’m able to continue doing this, I can only conclude that killing nearly 100,000 people must be an acceptable thing. After all, no one in the international community has done much more than verbally condemn my actions. So I’ve taken that as tacit permission to continue doing what I am doing, which, again, is brutally murdering tons and tons of people. As a side note: I do think it’s actually interesting that everyone knows how many people I’ve murdered, and yet nothing has happened to me. Don’t you think that’s interesting? In the 21st century? Anyway, I think it’s interesting. You see, I control a strong military, so I have been able to send soldiers to kill pretty much whomever I want. Some days there will be a public demonstration against me, and I’ll have the police fire live rounds into the protesters. And then sometimes I’ll send up an airplane and it will drop a bomb that kills dozens of defenseless people in a few seconds. Then I’ll wake up the next morning and do it all again because nobody has tried to kill me or arrest me. That’s a pattern I’ve been repeating, unimpeded, for almost 750 straight days. Seventy thousand people: That’s 96 a day for the past two years. In fact, I just killed another person while you were reading that last sentence. This girl was in a house that was raided by my armed forces and she was shot and now she’s dead. Whoops, just killed her little brother, too. And her mom and dad. I really do wonder why none of you are willing to stop what is clearly uninhibited slaughter. There are newspaper articles about the rising Syrian death toll pretty much every day, and I’ve even been on television talking about all the people I’ve killed. And instead of being assassinated after my interview, I go back to my palace in Damascus, Syria—a location whose coordinates are available to every foreign government with ballistic missiles—eat dinner, and enjoy the evening like I’m just a regular person and not the architect of a nationwide holocaust. Now, I would assume you all have a pretty good reason for not making even a token effort to intervene and put a stop to this senseless bloodshed. Or you’re all just outright ignoring the carnage because you either don’t care or believe that interfering would be politically difficult. If that’s the case, I guess those legions of dead bodies are on your conscience, in a sense. Not that I care one way or another. In fact, I should thank you all for how little you’ve done to stop me. I really appreciate it. Anyway, I just thought you’d all like to know what I’m up to. The civil war is going into its third year now, so I’ll try to keep you updated on how many people I’m killing while you and your leaders continue to sit on your hands. Seventy thousand is just the U.N.’s official estimate, by the way. It’s honestly much, much higher than that.